Psycho Solo Diver – Online Diving Blog and more!March, 2009 | Psycho Solo Diver - Online Diving Blog and more! You are currently browsing the Psycho Solo Diver – Online Diving Blog and more! weblog archives for March, 2009. The ocean was extremely flat tonight; so flat that Instructor John and I took the mighty zodiac a little further than our normal anchoring spot to scout hopefully virgin lobster territory. I submerged in 35 feet of water; the bottom had some interesting reef structure and tons of low lying kelp and eel grass. The surge was strong; the kelp and I involuntarily moved back and forth about two or three feet. Visibility wasn’t all that great, and with the surge I had to move slow to look under the kelp and grass. I pinned a few monster bugs, until I measured them – all were short. At 1500 psi and at 35 feet, I grabbed for a huge bug, but the surge made me miss the pin and the lobster sprung up and hit me it the face before swimming backwards into a hole. I thought I was probably going to get skunked; even the larger lobsters were obviously spooked. Heading back to the boat I caught a legal bug with no drama; I think it knew its time had come when it crawled out of its hole tonight. At 800 psi, I saw a monster bug wedged between a jagged reef; I turned the light away, reached for it, the surge slammed me against the reef so I kicked away. Then the muscles in the back of my left leg painfully balled up – CRAMP! I was wedged between the reef and as I came up, my regulator hose got caught on part of the reef and pulled my regulator out of my mouth. Solo diving, with a leg cramp and now no regulator to breath off of! Obviously not, as I am writing this – I put the regulator back in my mouth and hit the purge button. Friends, dive training does pay off! Being extremely macho and calm in dangerous situations also helps. I headed back to the boat after a very short surface swim over light kelp. Instructor John had gotten skunked and came back early after getting quickly discouraged. I pose with my last liberated lobster of the season. The zodiac started without a problem and we began heading back to King Harbor. In the distance, a boat started flashing a white signal light at us. “That must be a dive boat, keep an eye out for divers in the water,” John yelled. The boat in the distance sped up and got closer, still flashing their signal light. “John, I think those are pirates! “Full speed ahead and keep going!” I yelled. John hit the throttle, but the boat caught up to us and cut us off. The boat had running lights, but the cabin was blacked out – I could make out two figures on board. “Gentlemen, California Department of Fish and Game, how are you doing tonight?” a stern voice yelled from the cabin. “Oh, fine,” I said, as I took my last gulp of beer. We told them that we had only one lobster and I admitted it was mine. I handed them my game bag, my fishing license and lobster report card. “Any more lobsters or fish on board?” the agent asked, as he peered over our many bags of dive equipment and emergency engine repair supplies. “The bug is good,” a voice said on the boat. Finally, paying for the licenses and report card have paid off! The rest of the voyage was routine. 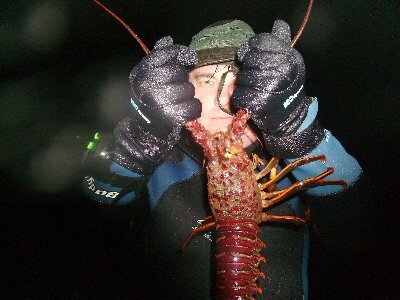 I will post a lobster season recap within the next few days.